This applicant for a job in the terra-cotta army was turned down. Now he works as a blogger. The terra-cotta warriors get lots of media attention, but they only comprise a small part of the tomb for the first king of a unified China. Since I failed to become a guard, I’ll switch roles and take you into the Qin emperor’s world. 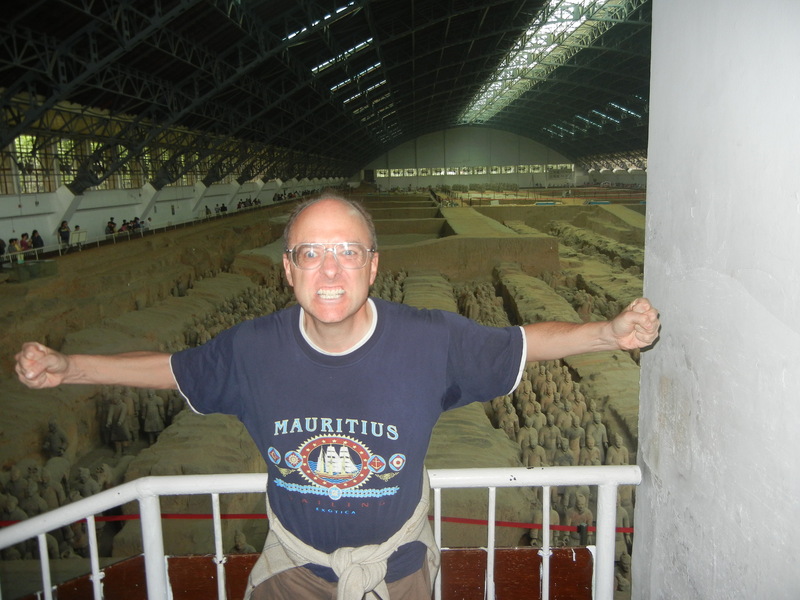 But first, we need to go back in time–China was already ancient when Qin Shihuang ruled (221-210 BCE), and he synthesized a lot of earlier ideas. 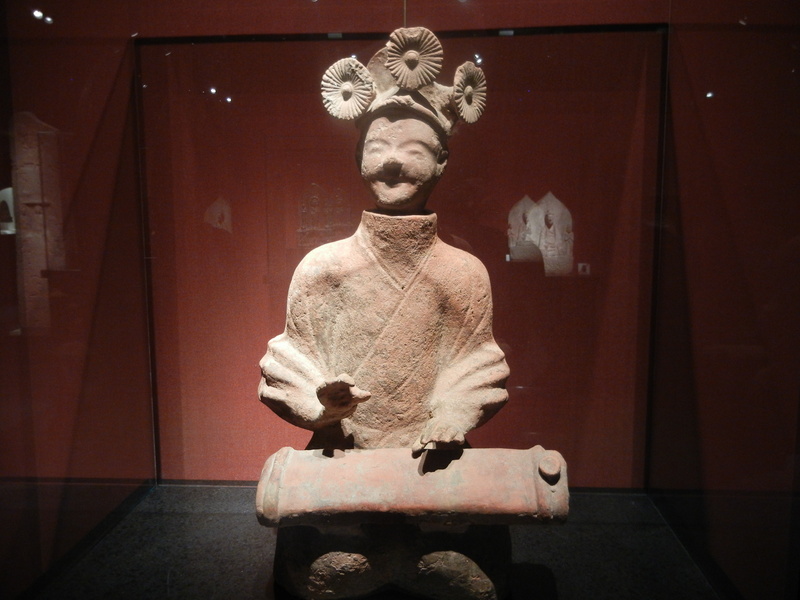 The Late Shang Dynasty (1200-1045 BCE) already had a well-developed cult of the dead king. They dug huge cruciform pits up to 42 feet deep, filled them with their greatest treasures, garnished them with blood of human sacrificial victims, and worshiped their kings as the state’s ancestors according to a precise ritual schedule. Continuity between the living and dead has always been a key feature of Chinese society, but a major change was occurring around 500 BCE. 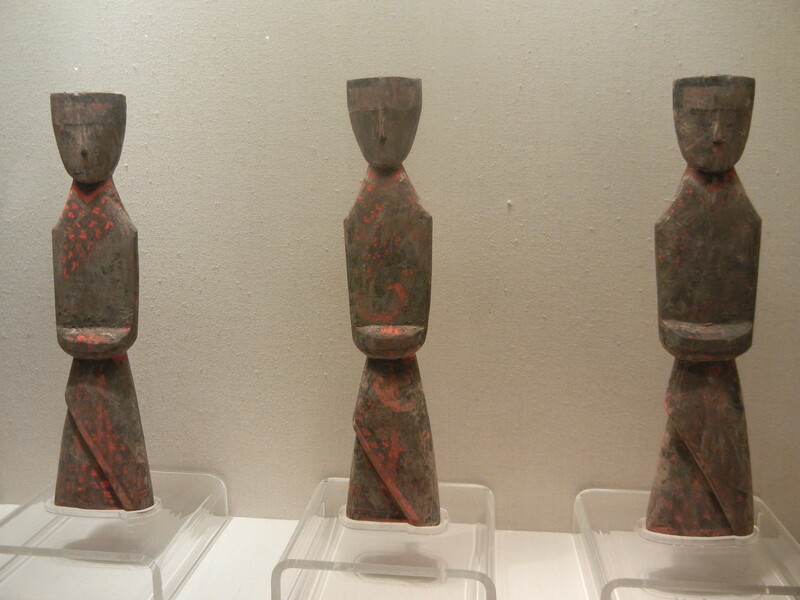 Jessica Rawson noted that Shang rulers didn’t put much stuff in their tombs from daily life. What a contrast with ancient Egypt. They put huge bronze vessels in them so the dead could be supplied with food and drink, but not much that suggested that they enjoyed themselves, or had existences as individuals. They only received offerings, and perhaps gave offerings to their own ancestors. But people then began to partition tombs into rooms as though they were models of homes. More folks supplied their tombs with tableware, clothes and musical instruments. 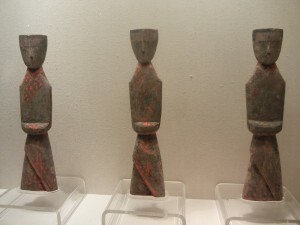 By the 3rd century BCE, elites made many models of servants dutifully standing (like the picture above the merry musician) or kneeling, awaiting orders. The zither player above is from the Han Dynasty. So tomb burials increasingly resembled the good-living that political leaders enjoyed in the world. Rawson thinks that this change might have been due to the break-up of the Western Zhou Dynasty in 771 BCE. People couldn’t take centralized rule for granted, and they began to see themselves as more distinct from the whole social body. Others have seen increasing self consciousness as a product of literacy–poems from the Book of Odes reflected on personal experience by 600 BCE. Qin Shihuang built the greatest tomb of them all in the 3rd century BCE. He brought together beliefs and practices from many regions in the vast land which he conquered, and took tomb construction to a climax. The terra-cotta army only guarded it. What else is down there? We’ll find out over the next few posts, beginning with The Terra Cotta Army, Part Two. Previous post: The Bayon, The Greatest Khmer Building Besides Angkor Wat?